The Highlights: A 25-mile riverside greenbelt that accesses a dozen parks; stations to rent bikes throughout the city; art and history museums; the Old Boise district and its Basque community; vibrant nightlife with numerous craft breweries and brew pubs. Other Places Nearby: Water sports at Lucky Peak Dam; rock climbing, hiking, mountain biking at the Table Rock sandstone mesa; the Sawtooth National Forest; Bogus Basin Ski Resort. Meetings & Event Options: Boise Centre with 50,000 square feet of meeting space is undergoing a 36,000-square-foot expansion. There are many other options for smaller gatherings, including the Spanish-style Boise Depot and its Great Hall, which has a 3,542-square-foot multi-story atrium. Unlike many big cities, there really is no need to escape from Boise to get away from the hubbub. The Idaho city has a small, vibrant downtown area that lacks traffic congestion most of the day and a 25-mile greenbelt for outdoors enthusiasts. The Boise River Greenbelt is a local treasure—a tree-lined, paved riverside pathway ideal for bicycling, walking or running for leisure travelers or group events. There are scenic views and a wildlife habitat, and the greenbelt offers access to about a dozen city parks. When the leaves are changing color in the fall, it’s quite a special place to see. Bicycling is most recommended for viewing the greenbelt sights. It is also a great way to detour to an adjacent restaurant or microbrewery. The patio of the Ram Restaurant & Brewery, for example, almost sits on the greenbelt, and other breweries and brew pubs are just minutes away. Boise Green Bike, which is operated by the regional public transportation authority, rents bikes at various stands throughout the city. To orient yourself, take a look at this useful map with lots of information about the greenbelt. Another map shows walking trails that connect to it. Visiting the parks adjacent to the greenbelt can be as rewarding as the greenbelt itself. 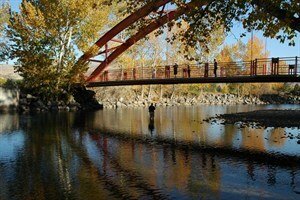 Julia Davis Park is the historic and cultural heart of Boise. Within its 89 acres are Zoo Boise, the Idaho State Historical Museum(closed for renovation), the Boise Art Museum, the Idaho Black History Museum and a science center, the Discovery Center of Idaho. The park also includes a large rose garden, four tennis courts, horseshoe pits, bocce courts, reservable pavilions and a playground. A boathouse rents paddle boats April-October for traveling on a pond and canals. Kathryn Albertson Park is a 41-acre urban wildlife habitat with wide, paved walking paths, gazebos and educational signs about the habitat. The park is often home to ducks, song and game birds, owls, herons, painted and box turtles, red foxes, beavers, rabbits and raccoons. Wildlife viewing is best in the early morning or evening. Veterans Memorial State Park contains a Memorial Plaza with monuments and memorials honoring America’s war veterans. They include a Combat Wounded Veterans Memorial, a Korean War Memorial and a POW/MIA Memorial. The park has walking paths, a lake with docks for fishing, playgrounds for young children and a reservable picnic site and shelter. On the banks of the Boise River is the 18-hole Warm Springs Golf Course, which offers great views of the foothills and the river. A 40-seat cafe is convenient for a quick breakfast or lunch—or a lunch barbecue on Fridays and Saturdays from Memorial Day through Labor Day. Of course, there’s more to Boise than its greenbelt. The eastern end of the city’s downtown commercial district is called Old Boise, which dates back to the city’s founding in 1863 and is filled with two-story brick buildings with stone trim. In the 1980s, Old Boise was named to the National Register of Historic Places. Mayor Cyrus Jacob’s 1864 home still sits on Grove Street. Other structures to look for are the 1879 Perrault-Fritchman Building, the 1892 Masonic Temple and the 1892 Spiegel Building (now Pengilly's Saloon). 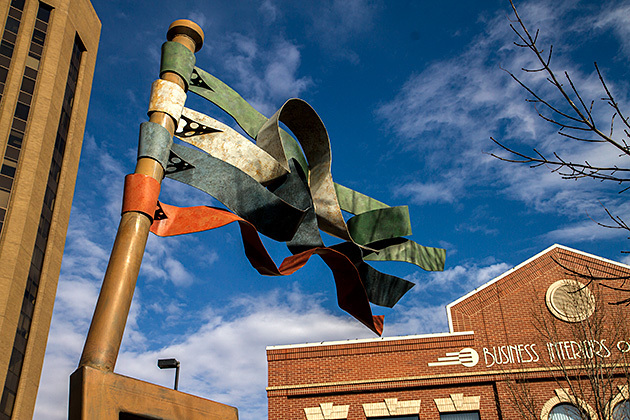 Part of Old Boise’s charm hails from Europe.The city is home to one of the largest Basque communities outside northern Spain. About 15,000 people of Basque descent live in Boise, and visitors on this Short Escape should reserve some time to soak up some of their culture. Basque Block in Old Boise is on Grove Street between Sixth Street and Capitol Boulevard. Grove Street is painted in traditional green and red Basque colors and marked by a large Basque cross called a “Laubduru.” A local dance troupe, the Oinkari Dancers, performs in Boise and worldwide, preserving and educating others about Basque customs and traditions. There are several annual Basque festivals, including the Sheepherder’s Ball, the St. Ignatius Basque Festival and the Wine Fest. Every five years, thousands of Basques worldwide come to Boise for Jaialdi, the Basque word for “festival.” Jerald features music, dance, food and sports event, including strength and wood-chopping competitions. The campus of Boise State University has become somewhat of a tourist attraction in recent years because of its blue turf football field in 36,000-seat Albertsons Stadium. It’s the home of the Broncos, a team that often finishes high in the national rankings. Besides checking the football schedule, it may be wise to see what concerts or other activities are happening on campus.